When you offer deep, focused content on your Web site, you’ll increase the likelihood that a search engine will direct higher traffic your way. Search engines look for depth of content. Your landing pages should each have at least three or four pages of supporting information that they link to. These sub-pages need to be within the same theme as the landing page that they support. Having several sub-pages linked from each landing page that all talk about the same subject theme reinforces your theme and boosts your landing page’s perceived expertise on the subject. Once you decide on primary subjects for your Web site, each with its own landing page, you need to decide whether further stratification is needed. Do you have natural sub-categories under your primary subject categories? If so, you probably want to create landing pages for this second tier, as well. For example, in a classic cars Web site, the secondary subjects under each car manufacturer might be the different models of cars, where you would create a landing page for each model. So the Ford landing page could link to individual landing pages for Ford Mustang, Ford Falcon, Ford Thunderbird, and so on. The concept of organizing a Web site’s content into distinct subject categories, each with its own landing page and supporting pages, is called siloing. 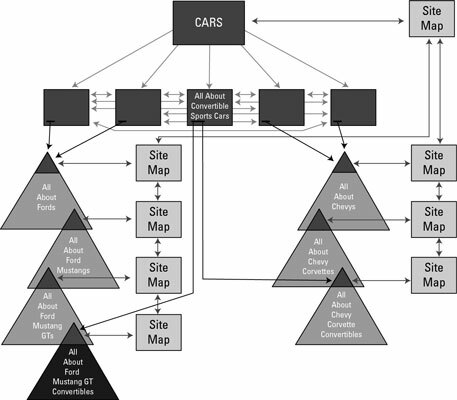 The above figure shows how a classic cars Web site could be arranged into silos. Keep each landing page’s content focused on its particular subject category. Make the content engaging — consider including video, audio, images, or dynamic elements along with highly relevant text (not in place of it!). Customize the keywords on each landing page to reflect that page’s subject theme. Be sure to include the keywords in the page content as well as in the meta tags. Include links to secondary pages in the same category. Don’t include links to secondary pages under different subject categories. A note about links: Hypertext links that lead to each landing page should contain your page’s keywords. You want the linked text that the user clicks (the anchor text) to be meaningful. Google keeps track of links to determine the relevancy of each of your Web pages. The link Ford Mustang Information and Pricing gains you a lot more points than Click Here because your page is not really about “Click Here” — it’s about Ford Mustangs. You definitely want to use good, keyword-rich anchor text for links going to landing pages in your Web site. You don’t have as much control over the links that other Web sites use to link to your pages, but as much as possible, try to have those links also show descriptive anchor text.